Pahang, Terengganu and Kelantan are located in the east coast of Malaysia, where most people are considered as culturally conservative. According to the statistic, Pahang has 34 institutes of higher learning (IPT) which is the highest number of IPT in the east coast, with 40,551 students and 3,270 academic staff. Terengganu and Pahang have 24 and 25 institutes respectively, but there is significant different in number of students: 40,741 in Terengganu and 34,955 in Kelantan. 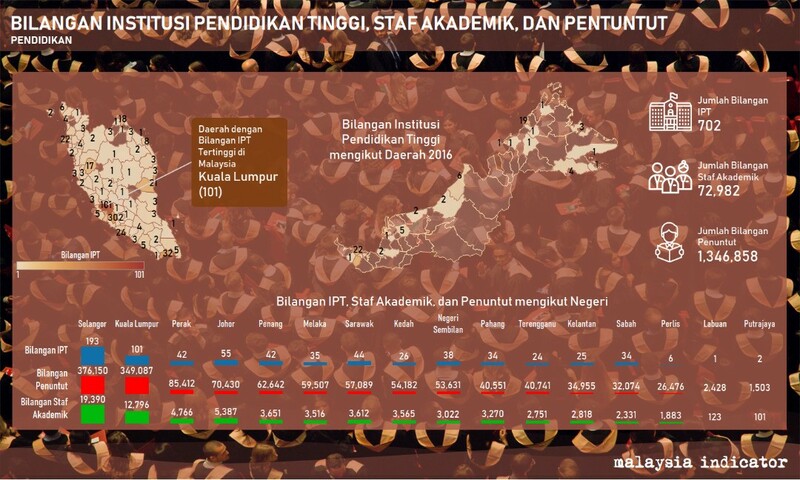 Pahang may have the highest number of IPTs among the three, but Terengganu houses the highest number of students. Thus, this brought up the question: Why students prefer to study in Terengganu compared to Pahang and Kelantan which provide more facilities and experts in academic? One of public universities in Terengganu, University of Malaysia Terengganu (UMT) is now ranked at number 19 in the top 70 universities in Malaysia as listed by LanguageCourse. One student wrote on her blog that the attraction of UMT is its own location, which is close to the Tok Jembal beach. Also known as Bandaraya Warisan Persisir Air, Terengganu is rich with beaches along its coastline and islands for tourist destination. Another public university listed on the list is Universiti Sultan Zainal Abidin (UniSZA), ranked at number 41 and located only 1.4km from UMT. Another reason could be the lower cost of living compared to Pahang, where its infrastructures are well-developed with shopping malls and railway stations built within the state. In February this year, Terengganu state government led by Menteri Besar Dr Ahmad Samsuri Mokhtar gave an initiative in the form of a certificate for first class honours degree with a CGPA of 3.75 or an overall of 80% in the undergraduate programs, and cheques worth RM4,000 and RM2,000 for professional and non-professional courses respectively. UMT Vice-Chancellor Prof Datuk Dr Nor Aieni Mokhtar hoped that the incentive would inspire other students to thrive in education in the future. Next Malaysia’s major fishery sectors in danger from pollution and exploitation.